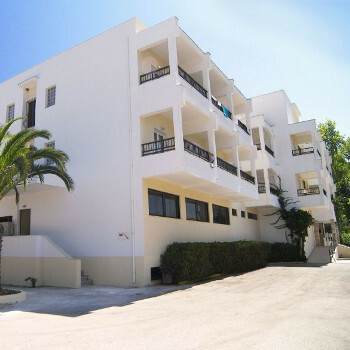 The hotel is situated in a wonderful beachside setting, but is also close to all the action of Kavos. If you enjoy a social atmosphere and lively surroundings, it is an excellent choice. Hotel was set right on the best bit of beach in Kavos. The noise from the main street could be heard slightly from rooms facing the road, but we had a sea view and so were not disturbed at all. The hotel was immaculately clean at all times. There were only a few staff as it is a small hotel and it was end of season - they were all extremely polite, freindly and helpful. We are vegetarians and the first night there we found no veggie option so we spoke to the waitress who organised an omelette for us. After that there was either a veggie option on the buffet or Costas the chef made us something special.His asparagus souffle was to die for and made a lot of the meat eaters wish they were not! We stayed at the San marina july 2007. There were 7 of us altogether and we had a really great time. We were right in the middle of the nightlife with 5 of our party being teenagers they loved it. The staff and cleanliness of the hotel was spot on and would definately go back again.There wasnt any entertainment on but was plenty of bars and restaurants to choose from our favourite being the drunken squid.